Attn: FFY will be taking a break over Christmas and New Year because dammit, I need it. I’m also v. tired and slightly anxious so I don’t really feel like being funny. To make up for it,I’ll write the entry out and stick a joke at the end, deal? So just scroll down to end if you want a laugh. For bad photos and mediocre writing, keep reading. To celebrate my SO’s birthday we booked a table at Braza Churrascaria in Leichhardt. 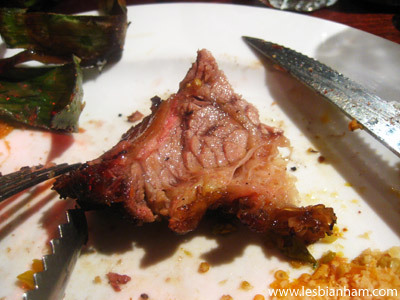 They do all-you-can-eat Brazilian barbeque and my SO, being a big fan of flesh, was very keen on the idea. I started with alcohol. This counts as bread. They give you a thingy what’s in the picture above. 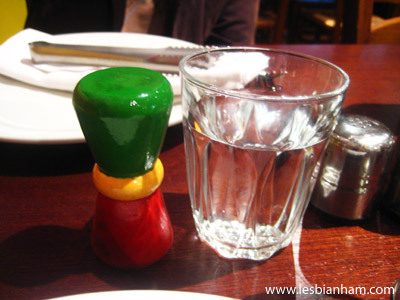 If you want to keep eating, place the thingy so the green bit is on top. You lay it down on its side if you want to take a break, and place the red bit on top if you want to stop eating and want them to clear your plate. They only give you one of these things per two people so make sure you sit across someone who shares the size of your appetite. The all-you-can-eat menu includes all the sides. 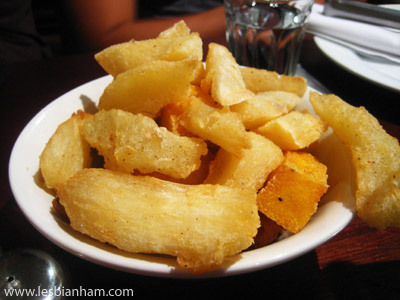 Above is a plate of deep fried cassava, polenta and banana. The fried bananas were absolutely amazing. The insides were pleasantly squidgy and sweet, which is like my perfect texture for banana fritters. The cassava is good, dunno about the polenta. It’s okay but I didn’t eat it again after tasting one – it was bland and I’m not a big fan of the texture. 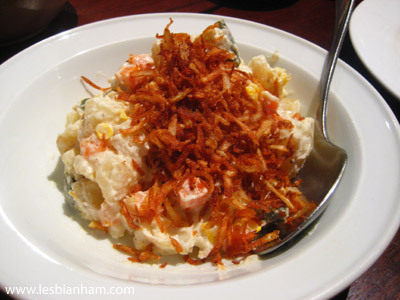 Delicious potato salad topped with heaps of crispy deep fried shallots. I love the contrast between the creamy potatoes and the crunchy shallots. Pimento reckons his mum makes better potato salad (I agree, but it’s still yummy). 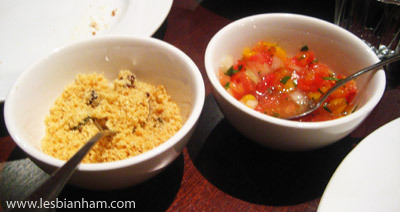 Garlic breadcrumbs (not sure what it was for so I just added them on everything) and a very flavourful tomato salsa. There was also a green salad but I didn’t bother taking a picture of it. The salad tasted like leaf vegetables. 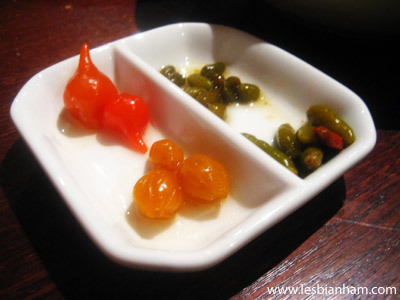 Pickled chillies arranged in order of heat. The gourd-like red ones are the least hot, then you go counter-clockwise until you get to the tiny ones. 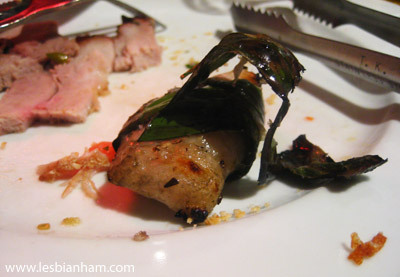 I was a wimp and cut up my green chillies into at least 5 sections before eating them. Availability of the above varies from night to night. It does feel a bit like they keep bringing the same things out for the first half of the night and only got the more unusual things (ribs, prawns) much later, which is a shame because by then most people are too full to try them. 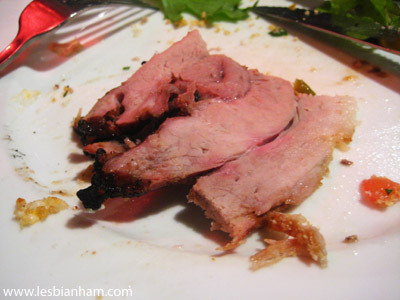 The meat tends to be on the salty side as well, but servings are generous and the meat are of decent quality. I found that a couple of the cuts of beef were overcooked (they tend to vary in doneness as they come out of the grill), but everything else is nice and juicy. Service was good – if you want one of the skewers that’s going around you might need to wait a little while. I’m not sure if the people taking the skewers around have like a predetermined route they need to take for all the tables or what, because certain things don’t seem to reach us unless we ask for them. They’re v. friendly though and are patient with requests for more than a slice of meat at a time. I had a 100% vegetarian day today because my stomach feels like someone’s placed a brick in it. Fibre is highly recommended for the morning after. Custom (Mod-ded? 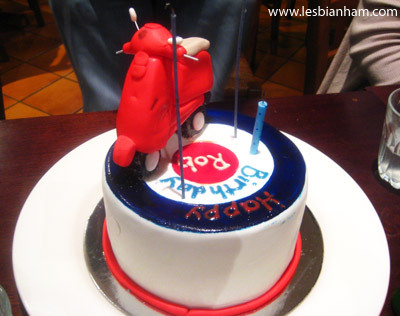 Har har please tell me you got that joke) birthday cake by Valerie of Love and Cake. I ordered a carrot cake, which was nice and moist and not too sweet. She also threw in some free Christmas cookies because she’s awesome. Enjoy your time off and I hope you have a great time away (make sure you pack enough undies). Will miss your honest and funny posts! 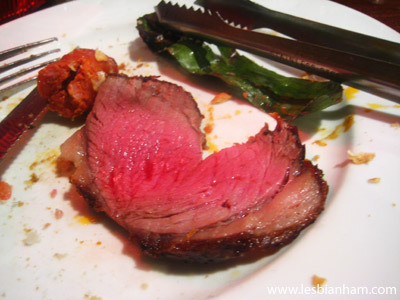 Wow – the Brazilians sure love their meat dont they… I have tried Wildfire for the Churasco but never this place- since it’s closer I may give it a try with my meat loving brother. Happy Holidays – hope to bump into you in the streets of Balmain soon! dude you know Valerie??? I used to work with her! did u get any pineapple? I preferred your writing and the humour contained within over “the joke”. Hurrah for meat-fests I say! Keep hearing good things about Braza. 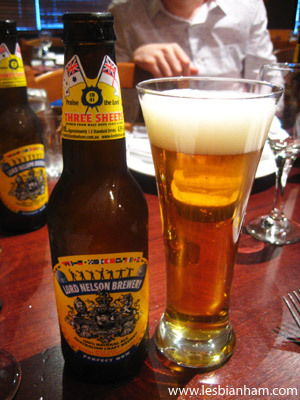 Will have to get here sometime soon. Some interesting sides, and groan at your joke. Very punny! Have a great Christmas and enjoy the break! hope you’re having a great holiday! love the post – this chicky just wanted to run right over to Norton Street and grab some of that meat – Happy New Year! Wow . . I would be adding garlic breadcrumbs to everything too!